South Africa is the archetypal water lover’s paradise. Whether you want to be by the sea, on the sea, or even under it, there are countless ways to get your ocean fix—including snorkeling, scuba diving, fishing, and surfing. Swimming is one of the easiest and cheapest ways to enjoy the water, and many of South Africa’s best beaches are tailor-made for taking the plunge. Here are ten of the country's unbeatable swimming beaches. Some of them are Blue Flag-listed, some are major tourist spots, and others are well-kept secrets. Almost all of them are located on South Africa’s east coast, where the Indian Ocean keeps water temperatures warm. Drive 40 minutes north of Durban to reach the picturesque coastal town of Ballito. Popular with holiday-makers, Ballito has a choice of pretty beaches—and the best for swimming is Thompson’s Bay. This scenic cove is sheltered from the wind and characterized by its calm waters, interesting rocky outcrops, and a fascinating geological hole-in-the-wall. There’s a walled tidal pool for those that are nervous to swim in the open ocean, making this spot a particularly good choice for families. Lifeguards and shark nets provide an additional layer of safety (although the nets are removed every year ahead of the annual Sardine Run). Located a 20-minute drive from central Durban, the resort town of Umhlanga is an upscale getaway for vacationing South Africans and visitors in the know. The main Umhlanga Rocks beach boasts safe swimming waters and endless golden sands, again protected by lifeguards and shark nets. In between bathing sessions, check out the Umhlanga Lighthouse or take a stroll along the beach’s whale-bone inspired pier. A paved walkway provides direct access to the town’s beachfront shops, restaurants, and bars. Although crowded during the December summer season, a festive atmosphere prevails to make this one of KwaZulu-Natal’s top Christmas spots. The coastal town of Gonubie is seen by many as a suburb of East London, one of the largest cities of the Eastern Cape. Its picture-perfect beach offers sheltered swimming areas, as well as a walled tidal pool for kids. The Gonubie River reaches the sea at this point, too, and offers an alternative bathing spot on days when the surf is bigger than usual. All along the river’s verdant banks, you’ll find a series of shaded spots perfect for summer picnics and barbecues. The beach is connected to Gonubie’s beachfront restaurants by a beautiful boardwalk, which provides an elevated vantage point for viewing passing humpback whales during their winter migration. Further south on the Sunshine Coast, the laid-back town of Port Alfred is home to Kelly’s Beach, which was awarded Blue Flag status for 2017-2018. A 400-meter stretch of pale brown sand, the beach, and its waters are exceptionally clean. There’s a demarcated swimming area for parents with small children, while a boogie board hire service allows kids of all ages to enjoy the gentle swell. The facilities here are excellent and include clean restrooms, ecological information boards, and year-round lifeguard services. Two viewing decks come in handy during whale-watching season, or for admiring spectacular sunrises and sunsets. Port Elizabeth’s main beach is one of only two in the country to have been awarded Blue Flag status for all 17 years of the program’s existence in South Africa. The long, gently curving stretch of sand gives way to calm waters perfect for swimming. Lifeguards are on duty during peak season (November to April), while on-site amenities include freshwater beach showers and wheelchairs ​specially designed to be pushed on the sand. With ample free parking nearby, the beach can become exceptionally busy in summer; but in winter, the crowds disperse and calm is restored. At any time of year, you’re within easy reach of the city’s best restaurants. Visitors to Garden Route jewel Plettenberg Bay are spoiled for choice in terms of blissful beaches, but Central Beach is one of the best for safe swimming. It’s also the town’s most popular beach, and like many of the bigger entries on this list, can get crowded in summer. However, it’s a great choice for families, with plenty of amenities including public toilets, ice-cream vans, and restaurants within walking distance. Medium-sized surf makes this a good place to ride a board for the first time, too. There are lifeguards on duty during the summer season, and when you get tired of swimming, other activities range from whale-watching to kayaking and dolphin tours. Those wishing to step off the beaten tourist track should make their way to Noetzie Beach, located a 15-minute drive north of popular Garden Route stop Knysna. Accessed via an unpaved road and a flight of steep stairs, this secluded cove is rarely crowded even in the height of summer; yet there’s safe swimming to be had both in the sea and in the quiet estuary. Noetzie Beach is part of the Sinclair Natura Area, and the surrounding bush is full of local flora and fauna. It’s also something of a novelty spot, due to the eccentric, castle-like architecture of its most prominent homes. There are six castles here, five of which may be rented for a truly unique vacation. Situated between the city of George and the coastal town of Wilderness, Victoria Bay is a tiny cove known mostly to locals and avid surfers. While big waves pick up further out to sea, the gently sloping sandy beach makes for safe swimming conditions close to shore. With cliffs on either side and a handful of quaint beachfront cottages, this spot is also breathtakingly beautiful. Kids will love the walled tidal pool and the natural rock pools filled with fascinating sea life. A jetty provides a great view of the surfers on the point, while the grassy area above the beach is perfect for barbecues and picnics. If you don’t feel like bringing your own food, head to Vikki’s restaurant instead. Perched on the east coast of the Cape Peninsula, Boulders Beach is most famous for its protected colony of African penguins. However, its white sandy shore is also home to some of the safest swimming in the Cape Town area, thanks to the giant granite boulders that protect its waters from currents, wind and large waves. The view across False Bay is also mesmerizing. The bay’s unique oceanography makes the water here slightly warmer than can be expected on Cape Town’s Atlantic coast (although swimming is still an endurance test in winter). The highlight here is the chance to swim alongside the beach’s penguins—but be careful not to chase, feed, or touch them. Those with a high tolerance for cold water should travel around the Cape Peninsula to the Atlantic shore, where the residential suburb of Llandudno awaits. 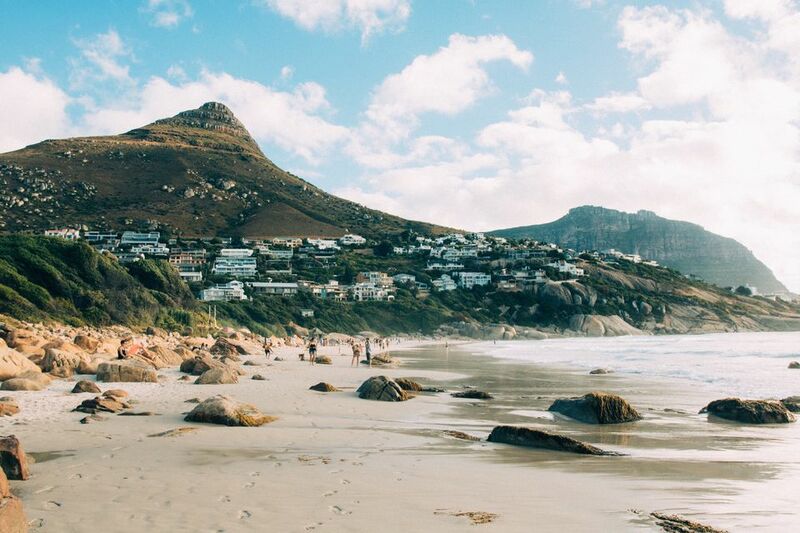 Located 30 minutes south of central Cape Town, Llandudno’s crescent-shaped cove is beloved by locals for its sheltered beach and shallow waters. The scenery is stunning, with granite boulders washed by a clear, aquamarine sea that often appears tropical despite its frigid temperature. Llandudno is one of the Mother City’s quietest beaches, and the facilities here are almost non-existent. Bring your own refreshments, and spend an idyllic day picnicking in between invigorating bathing sessions.